Scientists figured out what our planet's core was like back then by looking at crystals the size of grains of sand. "Those tiny magnetic particles are ideal magnetic recorders," said co-author John Tarduno, the chair of the Earth and Environmental Sciences department and a professor at the University of Rochester in New York. "When they cool, they lock in a record of Earth's magnetic field that's maintained for billions of years." So, by sticking the crystals in a magnetometer, the researchers were able to figure out that the particles' charge was very low. In fact, 565 million years ago, Earth's magnetic field was over 10 times weaker than what it is today — the weakest ever documented. But then the geodynamo got a kick start once more — from the very core of our planet. 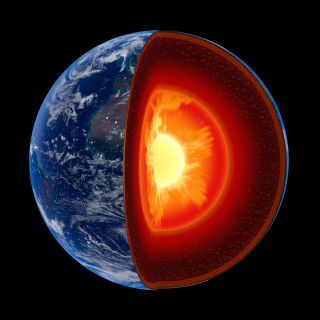 In Earth's early years, the core was all liquid. But at some point — guesses range from between 2.5 billion years to 500 million years ago — iron began to cool and freeze into a solid layer in the middle of the planet. As the inner core solidified, lighter elements like silicon, magnesium and oxygen were kicked out into the outer, liquid layer of the core, creating a movement of fluid and heat called convection. This movement of fluid in the outer core kept charged particles moving, creating an electrical current, which in turn created a magnetic field. This convection drives and maintains the magnetic field even today. Earth's inner core is continuing to solidify and will do so for billions of years to come. But this is mere speculation, Tarduno said. When Earth's magnetic field weakens a bit during events such as magnetic reversals (where the north and south poles flip), for instance, there's no evidence that species are affected, he added.